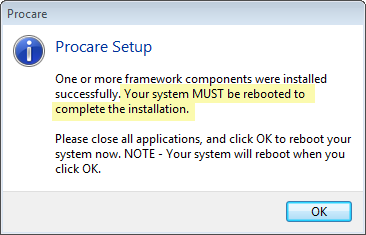 Check to see if your computers are compatible with Procare 10.3. Your computers must be compatible in order to use Procare Cloud, or for non-Cloud customers to install any new Procare updates or use Tuition Express. See: System Requirements. See: 10.3 Release Notes.  Important! Be sure to run the compatibility check on each computer that runs Procare. Microsoft no longer provides security updates for older, non-supported operating systems. Don’t take a risk with your technology. Update your operating system to a secure and supported version of Windows. Newer operating systems allow us to continue enhancing Procare, now and into the future. Secure payments through Tuition Express require recent versions of Windows. If your computer does not pass all the compatibility checks (or shows a warning/yield sign), take the following steps. Example: Windows does not pass. For Windows 10, check for Windows 10 updates. Open the Start Menu and go to Settings > Update & Secruity Settings > Windows Update > Check for updates. For Windows 8, follow the steps from Microsoft to upgrade to Windows 8.1. For Windows 7, download Windows 7 Service Pack 1 (SP1) from Microsoft—and once the Service Pack in installed, check for any additional Windows 7 Updates. Go to Start > Control Panel > Windows Update > Check for updates. For Windows Vista, XP or other versions of Windows, you must upgrade to a current, supported version. Procare recommends Windows 10. See: System Requirements. After upgrading Windows, run the compatibility check again. Example: Windows passes, but other components do not. 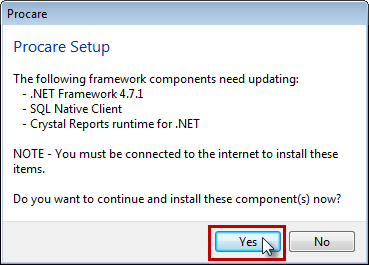 Example: The Update button installs Windows components. A message lists the components that need updating. Say Yes. Follow the on-screen prompts. Note: Be patient. There may be a long delay between one item being completed and the next item starting its installation. You may be asked to reboot your computer. If so, make sure all programs are closed before choosing OK. Example: You may be asked to reboot your computer. After installing all the updates, run the compatibility check again. This time everything should pass. Example: Windows and all components have passed.